A 3D-printed functional part from Essentium. Chemicals giant BASF (Ludwigshafen, Germany) has made a commitment to do its part in taking 3D printing to the next level across all major additive manufacturing technologies. For some time now, it has partnered with HP to develop materials that can be used in its Jet Fusion 3D Printing technology. Yesterday, it announced that it is teaming up with Essentium (College Station, TX) to create more robust parts for mass production by leveraging that company’s fused filament fabrication (FFF) technology. BASF brings to the partnership the most comprehensive portfolio of innovative materials in the chemical industry, while Essentium provides its FlashFuse electric welding technology, which enhances layer-to-layer adhesion of 3D printed parts, said BASF in a press release. 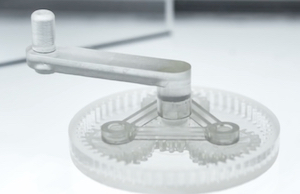 The companies report that they are combining their core strengths to provide a range of polymer solutions that overcome the traditional interlayer weakness of 3D printed parts. Essentium’s FlashFuse technology performs in-situ welding, which can be applied to multiple open-system FFF printer platforms. This electric welding technology helps boost isotropy, an indicator for the homogeneity of a structure, and ramps up vertical strength and mechanical toughness of the printed parts, according to company information. The attraction of FFF printing technology, as opposed to other additive manufacturing methods, resides in its compatibility with a range of thermoplastics, the capability to fabricate large, complex parts rapidly and efficiently, and the opportunity to easily combine multiple materials in the same printed part. In addition, FFF is uniquely suited to provide printed parts that are both structural and composed of filaments loaded with functional fillers, according to the company. “I am confident that our collaboration with Essentium will enable the creation of 3D-printed functional parts and make the technology accessible to a broader range of industrial customers,” said Kara Noack, head of BASF’s 3D-Printing business in North America.